This offbeat trek to the Laka Glacier offers some of the most amazing views of Dhauladhar mountain range and Kangra valley. Free Facility to freshen-up/change at Mcleodganj Base Camp. Free Facility to keep luggage at Mcleodganj Base Camp. Experience trekking to a Glacier. Daily Departure: Guaranteed departure for even a single member. Road transportation: All road transportation after the reporting point is included in the cost. Laka Glacier Trek is about 8 km from Bhagsu Nath and in all 13 km from Mcleodganj. Right from winters to June, there is snow and ice at the glacier. March to June is the best time for this trek. Post-June, glacier begins to decrease and by July/August, not much snow will be left. You will have to report at the Base Camp Mcleodganj earlier than 10 am. Post which you will be trekking to Triund via Dhramkot & Naddi which will be a 9 km trek and will take you 4 to 5 hours. You will have your lunch on the way. You will be camping overnight and relish warm served dinner at Triund campsite. On the second day after breakfast, the journey starts from Triund to Laga Got. The trail goes through a glacial moraine to Laga Got which is an open meadow, a temporary shepherd encampment and it will be a 6 kilometres trek and will take you 6 hours to reach. You will be camping overnight at Laka Got. On the third day, you may check out from Laka Got after breakfast. Post which you will be trekking 14 kilometres back to Base Camp Mcleodganj via Bhagsu Falls and reach Mcleodganj by afternoon (around 4 pm). Is mobile network available at Triund and during trek? Mobile reception is available in some stretches during the trek, but Triund does not have mobile reception. Vodafone & BSNL network does show-up sometimes but would not be of much use. What all things do I need to carry for Triund trek? As Triund trail is little rocky, hiking shoes are recommended, have at least shoes with a good grip and extra pair of socks. A warm jacket according to the season and must carry a raincoat or poncho in rainy season. There is no need to carry food/snacks as there are shops & cafes along the trail and also on top. Can I bring my 3 year old kid with me on this trek? Although Triund is an easy trek, conditions at Triund Top can be unpredictable sometimes. Bad weather if encountered may not be best for small child. Camping at night with 5 year old or younger child on Triund Top is not advisable. Day hike can be done. It was an amazing experience . Everything was arranged very well. The trekking experience was amazing! Our guide, Mr. Dhiraj was very supportive and his enthusiasm at taking us to various locations of the trek was unending. The food and accommodation was simple and nice! The trek route till Triund is fairly easy, and slightly challenging at some stretched towards Laka glacier but picturesque throughout! Just one suggestion, it would be nicer to have snow tents rather than having the regular tents. No amounts of sleeping bags are enough to keep out the cold. It would have been good if we cud have camped at glacier. Otherthan that everything was good. 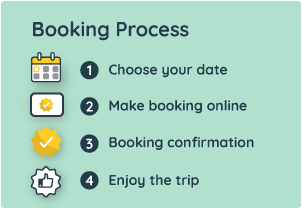 You will receive complete Operator information, including local telephone numbers at your destination, in your Booking Confirmation Voucher instantly.